I just picked up a Dinotte tail light. A real review of the light is coming later after I get a chance to try it out. Mounting the light has been a challenge for many the simple O-ring system included works great for front lights, not so great for tail lights. Dinotte’s released an updated frame mount recently, but I’d rather have the light on my excellent Alchemy Goods messenger bag since I frequently switch bikes but always bring my bag. Here’s a mounting option I made for the bag, out of $4 of pvc pipe. It tucks into the external side pockets on the messenger bag. The mount let’s me adjust the aim of the light both left/right and up down. The AG Messenger bag has two external pockets on the sides of the bag. I usually use the pockets for my saddle cover. Since the pockets are made of inner tubes (like the rest of the bag) they are pretty grippy and stretchy. 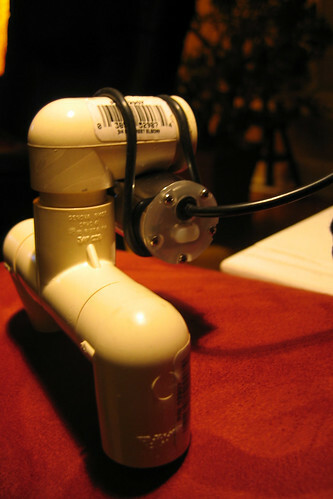 My mount consists of a 3/4inch PVC ‘T’, 3 matching elbow fittings and a slip-fit bushing. Two elbows go on to the ‘cross’ edge of the T, and are adjusted so the elbows follow the same plane as the T fitting. 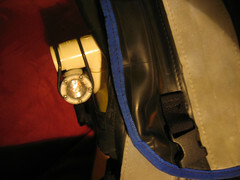 The 3rd elbow points outward, and provides a mounting spot for one end of the Dinotte O-ring. The elbows aren’t quite long enough to reliably fit both sides of the O-ring, so I picked up a bushing as well, which I fit in to the elbow leaving just enough of a seam to allow the other side of the O-ring to slip into. To aim the light right or left, I can just turn the 3rd elbow in the direction I want. Aiming the light up or down is done by rotating the light engine and O-ring on the elbow/bushing joint. The aiming feature is important since the bag could fall on various parts of my back and point in various directions depending on the contents or day. The battery pack fits perfectly inside the legs of the mount. The mount fits into the external pockets with a bit of work, which is also great. The small amount of stretch I get on fitting the mount in the pocket ensures the whole apparatus stays put. More Pics here.